LeapFrog have recently announced the LeapPad Ultra as a top of the range kids educational tablet. The LeapPad 2 is available alongside the new model and will still be a good choice for some families. There will also be a new LeapPad 2 Power model with an included rechargeable battery which addresses one of the concerns that parents have had with the LeapPad 2. In this article we'll take a look at the features of the range LeapPad tablets for 2013 and highlight where there are important differences that you should consider. LeapFrog have taken the approach of introducing a new top of the range kids learning tablet. The LeapPad Ultra offers a larger 7" screen (versus the LeapPad 2's 5" screen) but a slimmed down and slightly more grown up design. It also has faster hardware which makes it more future proof - at some point we may start to see titles that only run on newer models. The LeapPad Ultra also has a convenient built-in rechargeable battery just like grown up tablets. The Ultra is a mid-way point between a LeapPad 2 and choosing an Android tablet. It will still appeal to kids who might feel they have outgrown the LeapPad 2 (and see it as a toy for little kids) while keeping them in a safe and educational environment with lots of the quality content that LeapFrog have a reputation for delivering. The LeapPad 2 is a less expensive option than the LeapPad Ultra but still gets you access to the educational kids cartridges and download apps games and eBooks. My younger son has the LeapPad 2 and he's still very happy with it and asking for new games for his 5th birthday. This is still a very good children's tablet, especially for the 3-5 age group. It's very solidly constructed and a good size for little hands. 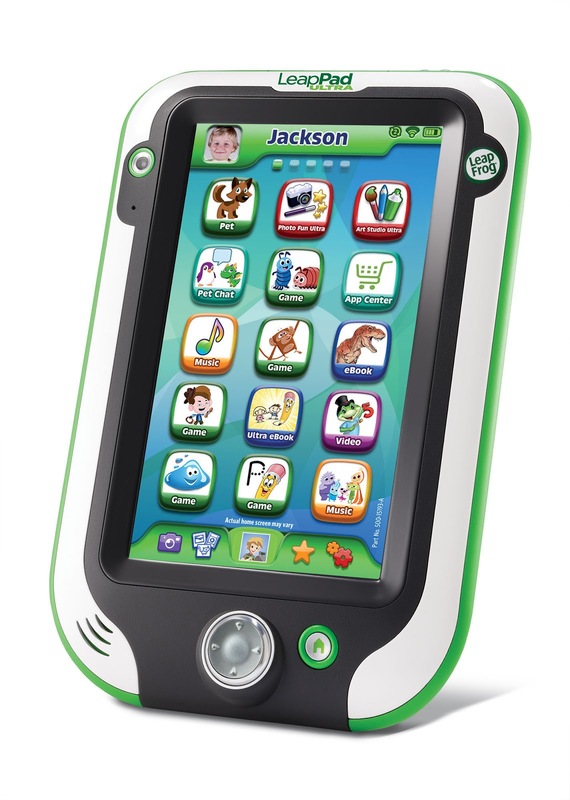 It's also a good option if your budget can't stretch to the LeapPad Ultra but you want access to the LeapFrog content. It runs off AA batteries. We use regular rechargeable ones which has been a good approach for us, we just keep a supply of charged batteries and quickly swap them when we see the battery low indicator. There's also the LeapPad 2 Power model which bundles a rechargeable battery pack and charger with a LeapPad 2 with a fresh design. This means that you can just plug in the tablet to charge rather than having to replace batteries. Lots of parents prefer this approach as it makes it simple to get into a routine of just plugging in the tablet to charge like other devices the family owns. A rechargeable battery pack and power supply are already available to buy separately but this bundle will reduce the overall cost. The LeapPad range of tablets have excellent educational content and are well designed for little kids, the LeapPad Ultra extends the appeal for the upper part of the age range. If you think you're likely to regret not having access to the internet content at some point over the next year then the LeapPad Ultra will be the better choice. 7" screen vs 5" screen - the LeapPad Ultra is obviously a bigger device to hold. A bigger screen is good for drawing, reading and watching videos. Is it important to have Wi-fi to download content and sync the device? For the LeapPad 2 you need to use a cable to connect to a computer. Do you want access to a library of curated internet content for a bigger choice? Or would you rather your child focused on a smaller number of titles in depth? The LeapPad 2 is out now and can be used during the summer vacation whereas the LeapPad Ultra will be in stores from early August. Is there a bundle or cover that will appeal to your child like the LeapPad 2 Monsters University bundle with a cool case and other accessories. These things can be important to little kids!